I love supporting local businesses when possible, and on top of that- I LOVE a good deal! All of this fresh produce was only $9.50; can you believe all this loot? I found it at Port City Produce, a stand near my house in Wilmington. There's nothing worse than wasting food, so I use my produce as a centerpiece on my kitchen table so I don't forget about it. Most fruits and veggies are fine at room temperature, though if I don't use lemons or limes within a few days I transfer them to the fridge to store. 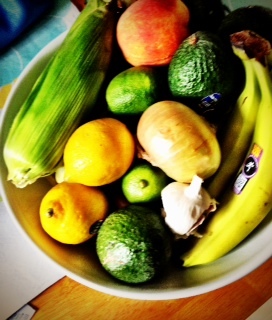 I use the produce as inspiration in my cooking; almost like a challenge- use it before you lose it! Enjoy!